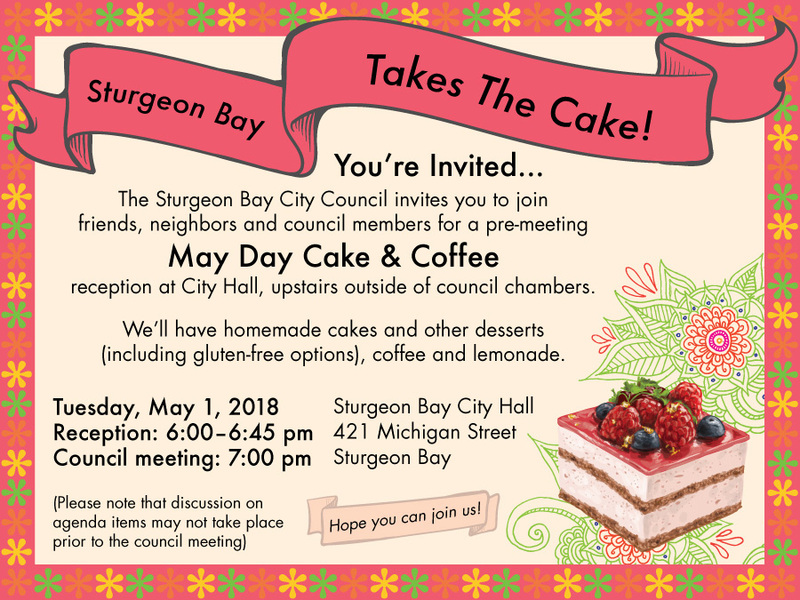 The Sturgeon Bay City Council invites you to join friends, neighbors and council members for a pre-Council-meeting Cake and Coffee reception at City Hall. The Sturgeon Bay Historical Society (SBHS) is pleased to announce that a donor family has committed $1,250,000 toward the repair, restoration and future maintenance of the historic 1901 Teweles & Brandeis grain elevator, situated on the City of Sturgeon Bay’s westside waterfront, for public benefit. The $1,250,000 commitment, facilitated by the Door County Community Foundation, stipulates that the City of Sturgeon Bay, owner of the property, and SBHS work in collaboration on future plans for the structure. It also stipulates that a portion of the gift be set aside in an endowment for the granary’s ongoing care. In early 2017, SBHS submitted an application to the Wisconsin Historical Society to have the granary listed on the Wisconsin Registry of Historic Places. In August of 2017, the listing was made official at a ceremony in Madison. The granary is expected to be added to the National Registry of Historic Places within the coming weeks. SBHS has offered to fund a follow-up analysis by MBJ to determine if its 2013 findings remain relevant. SBHS is committed to public safety and to procuring the data necessary to do a full assessment of the structure’s soundness. SBHS looks forward to working with the City of Sturgeon Bay and the greater community. “Our goal,” states SBHS president, Christie Weber, “is to stabilize and restore the grain elevator so that it can continue to tell the story of Sturgeon Bay and Door County’s agricultural past. Exactly how that happens will depend on a lot of community input. We have a talented community and a talented City staff. We hope that the details will be worked out in the coming months, but we’re thrilled that this generous gift ensures that, no matter what else happens with the surrounding property, the grain elevator will remain an iconic structure on the westside waterfront and a symbol of this community’s commitment to its history.” SBHS is open to partnering with other entities in developing the grain elevator’s future. SBHS will be asking the Door County community to contribute additional funds as the restoration project proceeds. Weber notes that, “In addition to dollars and ideas, we are interested in any stories and photographs people have related to the grain elevator.” For more information, and to make a pledge of support to SBHS and the granary, please visit: www.centerlineforum.org/historic-granary. The mission of the Sturgeon Bay Historical Society is to preserve Sturgeon Bay’s living history, which defines our community character and our cultural evolution, for future generations. Read the Door County Community Foundation's letter to the City. On Friday, the Wisconsin Historic Preservation Review Board affirmed the significance of the Teweles & Brandeis grain elevator, located on Sturgeon Bay’s west side. By unanimous vote, the Board approved the granary for inclusion on the State Registry of Historic Places, noting the role it played in the region’s community and agricultural life. The Board action culminates a designation process that began in 2015. The State Historic Preservation Officer will now forward the Board’s findings to the federal Department of the Interior, which will evaluate the granary for listing on the National Register of Historic Places. Alderman Kelly Catarozoli also attended the Friday meeting in Madison. “Many cities’ most beloved places were once abandoned historic structures that have been returned to economic productivity thanks to thoughtful rehabilitation. Some people see only a dilapidated structure, but we’ve come a long way from redevelopment by wrecking ball. With the Maritime Museum, the trail system and Sawyer Park, we’ve got the makings of a waterfront cultural district. That would be consistent with the site’s status as public land and also complement the commercial and industrial uses we already have along our waterfront. The more distinctive Sturgeon Bay becomes, and the better the access we provide to the water, the more competitive we will be as a tourism destination too,” said Catarozoli. The building’s distinctive profile and waterfront location make it attractive for a range of public, private and not-for-profit uses. “National designation would also help a future not-for-profit user, because the building’s rehabilitation creates another fundraising objective they can use to attract support. The Historical Society is working to get a handle on the building’s renovation requirements and clarity about what the Sturgeon Bay City Council needs to become confident that adaptive reuse is the best strategy for the granary and the City,” said Weber. For further information, contact Kelly Avenson at (920) 559-0504. Granary rendering by Kelly Avenson, an example of what a simple paint job could do to the granary and how with just a little love the Granary could have so much life back. Toward that end, the group has submitted a professionally prepared application to the National Register of Historic Places (NRHP) for designation of the Teweles and Brandeis grain elevator located on the westside waterfront. Historic preservation consultant Tim Heggland prepared the application and has successfully submitted over 100 NRHP applications. The application was pre-approved by the State before being submitted to the federal agency. Application materials are available here. Weber noted that SBHS will also seek to have the historic Cardy Paleoindian site on the City’s west side incorporated into the Ice Age Trail that runs just blocks from it. The Cardy site is one of the state’s most significant Ice Age-related sites and is listed on the Wisconsin and National Registers of Historic Places. Community members have met twice and will continue to meet, to discuss the historic value of the Teweles & Brandeis Granary on the westside waterfront and how to best protect it and share its stories. See a wealth of information about our historic granary. The mission of the (not yet formed) Historic Granary Collective is to explore and discuss the most appropriate way to honor, protect, preserve and sustain the historic Teweles and Brandeis Granary on Sturgeon Bay’s westside waterfront. As the last remaining waterfront icon to our agrarian past, the Granary embodies the struggles and ingenuity of Door County’s early settlers and represents an important chapter in our history. The Historic Granary Collective will also assess the best ways to communicate and celebrate the legacy and stories of the Granary and the people who relied upon it. We think you will enjoy reading the stories of the granary, and please let us know if you would like to be involved. Sturgeon Bay - In response to the City of Sturgeon Bay’s RFP (Request for Proposals), a proposal has been submitted for development on the West Waterfront that envisions a public and private partnership to repurpose the Teweles and Brandeis Granary making it once more an economic and iconic center of Sturgeon Bay. Under the proposal, the repurposed Granary would be a magnet for vibrant community activity (entrepreneurial and recreational) and create a new “Granary District” or “Granary Neighborhood” in Sturgeon Bay’s west side. In exploring possible uses for the Granary, the project supporters recognized the need for information from professional and respected architects, developers, artists and builders. Is it feasible to repurpose a 1901 structure built for a specific use? “To answer this question, we began with the belief that sound input from professionals in the field would inform dialogue and might inspire ideas beyond those presented so far. With the help of investors, the project team hired The Kubala Washatko Architects (TKWA), an award-winning firm of Cedarburg, to provide the renderings and Middleton Consulting and Contracting (MCC) to provide cost estimates” said Laurel Hauser, Project Principal. The proposal offers a two-stepped vision, the first step activates the Granary by stabilizing the building, removing all the walls on the ground floor leaving a small “forest” of posts creating public space for picnics, weddings or gathering all with views to the water and the tug boats. The second step activates the upper portions of the Granary making three floors with small “wood walled” office space made from the grain bins which would be available to incubate artists, non-profits or technology ventures. The top floor and Granary head house may offer meeting space with a view. “Think of an iconic destination in a city or town, it had a strong theme or icon to anchor and identify the neighborhood. Someday you will say, “meet me at the Granary” and it will be this neighborhood between the bridges” said Collins. A copy of the proposal can be found on the www.centerlineforum.org/ideas website. The principals have indicated that collaborators are welcome. The application process for listing the Granary on the National Register of Historic Places (NRHP) is taking another giant step forward. Professional Nomination Consultant Tim Heggland has been hired to complete a nomination for submittal to the Division of Historic Preservation. The overall process can take about a year and application does not mean the outcome will be a successful listing on the NRHP; however, Tim has a great track record. Tim has been active in historic preservation as both a private consultant and as a preservation planner since 1979. During this period he prepared 150+ successful NRHP nominations and 54+ successful Determinations of Eligibility (DOE) throughout Wisconsin. From 1980-1984 and again from 1993-1995, he was also employed as the Assistant Preservation Planner for the City of Madison, Wisconsin and served as the Acting Planner for the City during 1990. See centerlineforum.org/ideas for the history of the granary. Sturgeon Bay’s newly-formed Center Line Community Forum sponsored a trip last week to tour Eau Claire, WI’s award-winning Phoenix Park and downtown waterfront redevelopment. Center Line’s mission is to strengthen community, encourage civic engagement and explore ways in which smart growth has been successfully implemented in other communities. A group of eleven interested citizens was greeted by Eau Claire’s City Council President, Kerry Kincaid, and spent three hours touring Phoenix Park and hearing presentations by Eau Claire officials including the Redevelopment Authority Chair, Economic Development Director, City Attorney and Public Works and Parks and Recreation Director. In addition to City representatives, the group heard from developers and staff of companies that have invested heavily in downtown Eau Claire. Finally, the group met the director of the Farmers Market Association, a citizen group working in partnership with the City. In recent years, the City of Eau Claire has turned a brownfield site (once home to the Phoenix Steel Company and an Xcel Energy gas plant) into the cornerstone of a vibrant, revitalized downtown that includes the world headquarters of Royal Credit Union, JAMF Software, Riverview Terrace Apartments, Phoenix Park and Farmers Market. Eau Claire recently received the prestigious National Civic League’s All-American City Award, among others, not only for the 50 million dollar valuation they’ve injected into their downtown economy but for the process they used to do it. The following points summarize key components of Eau Claire’s success. Citizen Advocates: A Farmers Market and Labyrinth were on the community’s wish list. The city worked with “citizen advocates” who raised substantial funds to make each happen. The Farmers Market draws up to 7,000 visitors a week to the downtown. Natural Resources: According to Kincaid, the Eau Claire community cares strongly about its river. “You need to ask yourselves what relationship you want to have with your most important natural resource? That’s where we started. People value the water, and we are working to give the public as much visible and physical access to it as possible.” Eau Claire’s many city parks are connected by over 29 miles of hiking and biking trails, second only in the state to Madison. Eau Claire is actively engaged in extending its already significant public space. Private/Public Partnership: In reference to the point above, Royal Credit Union (RCU) first intended to build its world headquarters directly on the river. After hearing from the community, they voluntarily moved just off the river, allowing space for Phoenix Park. RCU was founded by a “home town boy,” Charlie Grossklaus, who is emotionally invested in Eau Claire’s success and wanted to do what was best for the community. According to RCU’s Randy Beck, “When we found out people wanted a park, we figured out a way to make that happen. A thriving community is good for business.” RCU and next door neighbor, JAMF Software, now overlook an attractive green space filled with people. Bikers and walkers are visible on the repurposed railway bridge that spans the Chippewa River and JAMF Software has even installed an air pump that’s available to the tubers who float past their office. Eau Claire calls JAMF a “home run” for the city because it is nonpolluting, high growth and pays high wages. JAMF brings energy to the downtown with a young work force that embodies “new urbanism.” JAMF is a dog-friendly office and many of the employees walk or bike to work. By all accounts, Eau Claire’s hard work has paid off. On the day of Center Line’s visit, school children laughed and chased each other over the boulders that line the river’s shoreline. Walkers and bikers were out en masse enjoying the views at the confluence of the Chippewa and Eau Claire Rivers. Shiny, attractive-side and street-level retail establishments serviced the people who live and work in the area. Center Line thanks the Janning Family, Bob Papke, Jeremy Popelka and Stephanie Trenchard and Virge Temme for sponsoring the Eau Claire Tour. Space is limited. Please register by Friday, April 17. For details, including how to register, see our Tour Details. Center Line’s first offering is a bus trip to visit Eau Claire’s award-winning Phoenix Park downtown redevelopment effort and meet with Economic Development Director Mike Schatz on Friday, April 24. Future events being planned address the topics of Young Entrepreneurs and Repurposing of Historic Structures among others. Center Line is co-chaired by Kelly Avenson, Charolette Baierl and Laurel Hauser. Steering Committee members include Nancy Aten, Bret Bicoy, Laurel Brooks, Rob Burke, Bill Chaudoir, Dan Collins, Heidi Hodges, Caitlin Oleson, Jeremy Popelka, Shirley Senarighi, Virge Temme and Stephanie Trenchard. Tax-deductible contributions to Center Line’s Speakers Fund may be sent to Center Line, c/o DCEDC, 185 E. Walnut St, Sturgeon Bay, WI 54235.